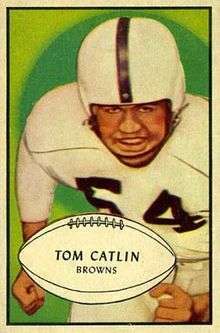 Thomas Allen "Tom" Catlin (September 8, 1931 – June 7, 2008) was an American football player and coach. He spent a total of 37 years in the National Football League, including stints as defensive coordinator with the Buffalo Bills (1978–1982) and Seattle Seahawks (1983–1992). Earlier, he had been a pilot in the United States Air Force. He was born in Ponca City, Oklahoma and died in Seattle, Washington.